Researchers at the Department of Epidemiology, Harvard School of Public Health in Boston have once again focused on prostate cancer prevention in a recent clinical trial. Specifically, they wanted to know if there were any healthy vegetables that could play a role in natural cancer prevention. They noted that previous research has suggested that cruciferous vegetables, tomato sauce, and legumes are all associated with reduced risk of advanced prostate cancer. For the most part, however, in vitro and animal studies have provided the proof that these foods may inhibit progression of prostate cancer. The researchers wanted to investigate these results in men. They decided to examine whether intake of total vegetables, and specifically cruciferous vegetables, tomato sauce, and legumes, after diagnosis reduce risk of prostate cancer progression. A total of 1,560 men diagnosed with non-metastatic prostate cancer and participating in the Cancer of the Prostate Strategic Urologic Research Endeavor — a U.S. prostate cancer registry — participated in the trial. As a secondary analysis, the research team also examined other vegetable subgroups, total fruit, and subgroups of fruits. The participants were diagnosed primarily at community-based clinics and followed from 2004 to 2009. The researchers assessed vegetable and fruit intake via a food questionnaire, and determined prostate cancer outcomes via urologist reports and medical records. In all, the researchers observed 134 events of progression. They found that men with the highest intake of post-diagnostic cruciferous vegetables had a statistically significant 59% decreased risk of prostate cancer progression compared to men with the lowest intakes (!). According to the researchers, no other vegetable or fruit group was significantly associated with risk of prostate cancer progression. 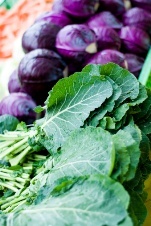 Want to boost your cruciferous intake? It’s simple — just follow this health advice and add kale, collard greens, broccoli, cabbage, Brussels sprouts, bok choy, or mustard greens to your weekly diet. The more, the better! For more on the amazing health benefits of cruciferous vegetables, read the article, Cauliflower, Kale and Cabbage Could Fight Cancer.